On 27 September 2017, EUROMIL hosted a rapid fire chat on the social dimension of the armed forces on the occasion of the Debating Security Plus online brainstorm. Participants debated best practices and problems with the implementation of military trade unionism in general as well as specific issues of common concern for military personnel. Military trade unions are very well established and respected as a social partner in some European countries, for example in Denmark where they are part of the joint council system existing since 1949. More than 90% of the military employees are members of the unions. From a Danish perspective, political leadership is necessary to ensure that soldiers enjoy democratic fundamental rights and freedoms – especially as their task is to protect democracy. Unfortunately, the situation of military personnel is more problematic in countries like Italy and Spain, where participants reported that associations have difficulties to gain a representative status which would ultimately allow them to take part in negotiations about pressing issues such as military health and safety and reintegration in the civilian labour market for military personnel with short-term contracts. The issue of whether military personnel should also be allowed to strike was discussed controversially. In some European countries (like Sweden) soldiers do have the right to strike – they however never used it. EUROMIL does not call for the right to strike as the organisation is aware that this might cause problems for national security. Experience however shows that in a well-regulated social dialogue issues can be solved during negotiations without invoking the right to strike. Even if there are also juridical possibilities to submit breaches of soldiers’ fundamental rights to European courts, EUROMIL believes that going to court should only be the last step – when all other means of negotiations fail. In fact, a better compromise can often be reached when all parties sit together and negotiate. Should negotiations fail, a court case might be the last resort. Additionally, most countries do also have national complaint mechanism and ombudsinstitutions (outside of the military chain of command) to which problems can be reported. EUROMIL believes that it is essential to promote the issue of “Citizen in Uniform” also on international level. The European Parliament added this dimension to its resolution on the European Defence Union in 2016. As long as security and defence issues are decided on a national level, the role of the European institutions is to encourage member states to work towards the harmonisation and standardisation of the living and working conditions of the military personnel. 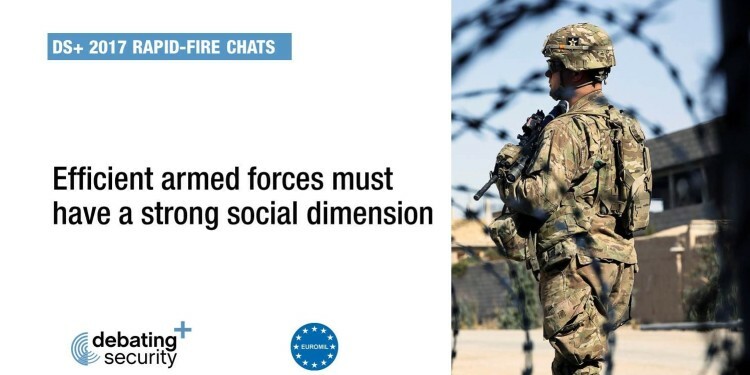 The future framework of the European defence should include a strong social dimension. When military professionals from different national backgrounds are working together, questions of identity and military culture arise, often connected to the question of its influence on the essential cohesion in military units. EUROMIL believes that as long as a few fundamental common principles (such as “Citizen in Uniform”) are respected, military diversity does not stand in the way of more European defence cooperation and integration. Last but not least, participants also looked towards the future and discussed the challenges which new technologies and the emergence of cyber as an operational domain will pose to the “soldier of the future”. These trends will force military authorities, associations and politicians to rethink the social dimension of security and of the military profession: the personnel needs training on new technological equipment and should remain “cognitively fit” in addition to physically fit.